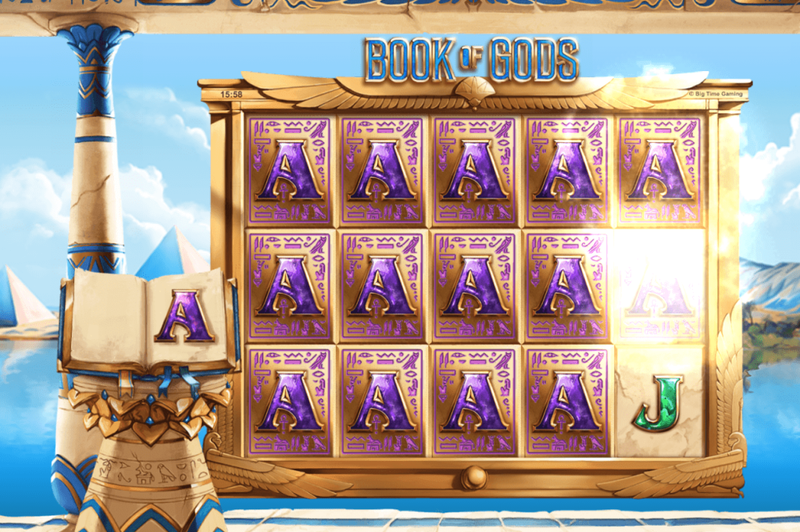 Welcome to Book of Gods from Big Time Gaming. This five reel video slot comes with 243 ways to win, an RTP of 96.35% and the now all familiar Feature Drop™ function, allowing us to purchase the bonus rounds. You find new features like Cloning Symbols, and volatility we only see from BTG. Are you curious about this new BTG release? Get in! One thing is sure, BTG is on fire nowadays, releasing one slot after the other with high volatility, feature drops and some insane potential -just like we want them! Book of Gods is no exception. Like with other similarly titled slots, it’s all about Egypt in regard to theme. We find four different gods as symbols, which plays an essential part during the free-spins, in addition to the standard card symbols 10-A. Instead of being placed in a dark Egyptian tomb, we are presented with what seems to be a balcony on one of the beautiful palaces of Egypt with some pyramids visible in the background. Whenever there’s a BTG release, we always wonder how far they have been able to push the volatility in the game this time around. 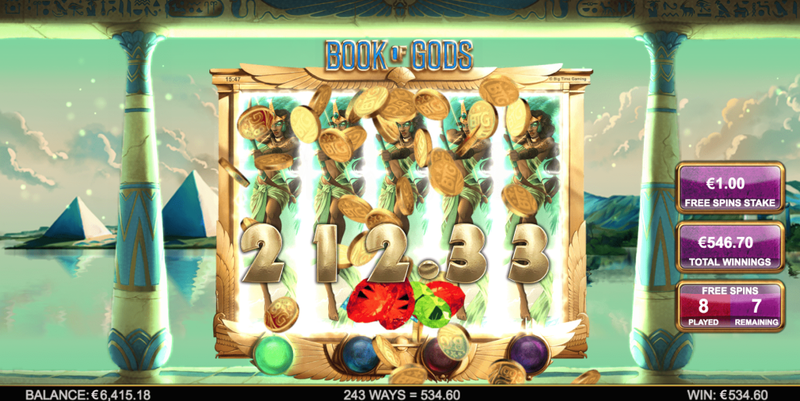 In Book of Gods, you can make some proper bets indeed. First, we find the feature drops, so you’re always welcome to get those bonus rounds started for 80x the stake. This puts it right in between White Rabbit and Extra Chilli which cost 100x and 50x respectively. Second with no real limit to the number of re-triggers during free spins we are bound to get some sick big wins from this game. At the end of each round and winnings are paid, the cloning symbol will clone itself to cover the reels it landed on. The pay is from left to right, and compared to other "book of" titles, the wild is included in a stacked symbol win. 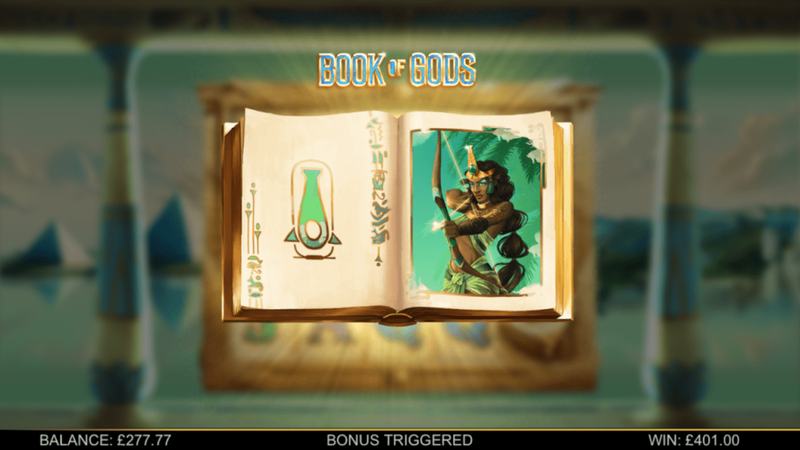 The free-spins in Book of Gods can be activated by both purchasing the feature with Feature Drop, or by landing three scatter/wild symbols on the reels. Keep an eye on the god indicator below the reels, to see how many cloning symbols you have activated with re-triggers. The wild work as normal during free-spins, even on the stacked wins. You can re-trigger the free-spins as many times you like, and the first three re-triggers will grant additional cloning God Symbols, until all of them are cloning, filling up your screen. After the third re-trigger, you will only receive additional free-spins. What would be nice to see is that “gamble the bonus feature” wefirst saw in Extra Chilli. If it is not clear yet, we are massive fans of the latest releases from BTG. With titles like Extra Chilli, and White Rabbit just behind us, and now with this one just around the corner, it is clear they are on a roll! We love this slot and honestly can’t wait to hear what you guys think of it as soon as it becomes available. The game makes sense, and although the symbol cloning is eerily similar to other features we have seen in other “Book of” titles, this is the first time we’ve seen a 243 version and it is great to see them during the base game as well.